John Adelman, "38724," 2017, gel ink and acrylic on canvas, 45 x 64 1/4"
John Adelman’s artistic skills are fully in evidence in eleven new drawings completed this year, each executed on canvas in gel ink and acrylic. They illustrate a wide range of formal approaches through which Adelman follows a strict set of rules to achieve his pictorial goals. This might be regarded as conceptualist process, but the result of his meticulous technique feels more important than the actions used to complete the pieces. He repeatedly uses text and certain shapes like nails traced on the surface while taking a tally. 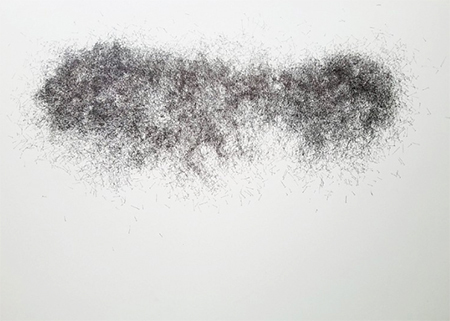 Many of the pieces, like the ethereal “38724," have the number of nails rendered over the surface as their title. From afar the nails look like a dark cloud or smoke hovering over a white background. As we move closer to the work, it becomes clear that the thousands of nails are discernible, creating depth and texture. Adelman’s drawings expand the possibilities of the medium through these challenging twists and turns that are surprising and mysterious. In the riveting 28677, 2017, he uses a blue background over an oval canvas about thirty-eight inches tall, starts with nails in white this time at their most dense at the perimeter. Then he slowly works inwards with fewer nails until stragglers trail off leaving a bright blue oval in the center. It almost looks as if peering down into the abyss; the feeling of being engulfed by an image has not been as pronounced since Pollock painted The Deep in 1953.